The Victoria Island's suburb of Oniru in Lagos, would be on free wireless cloud for the next 48 hours, courtesy of Airtel for attendees of Yudala Zero Gravity happening live at the Landmark Event Centre on Sunday October 2nd from 3pm, reports ITRealms. This is one of the many surprises lined up at this first edition of the mega music concert, with a host of superstar artistes including Olamide, Ali Baba, Cynthia Morgan, Naeto C, Zoro among others set to thrill the audience. 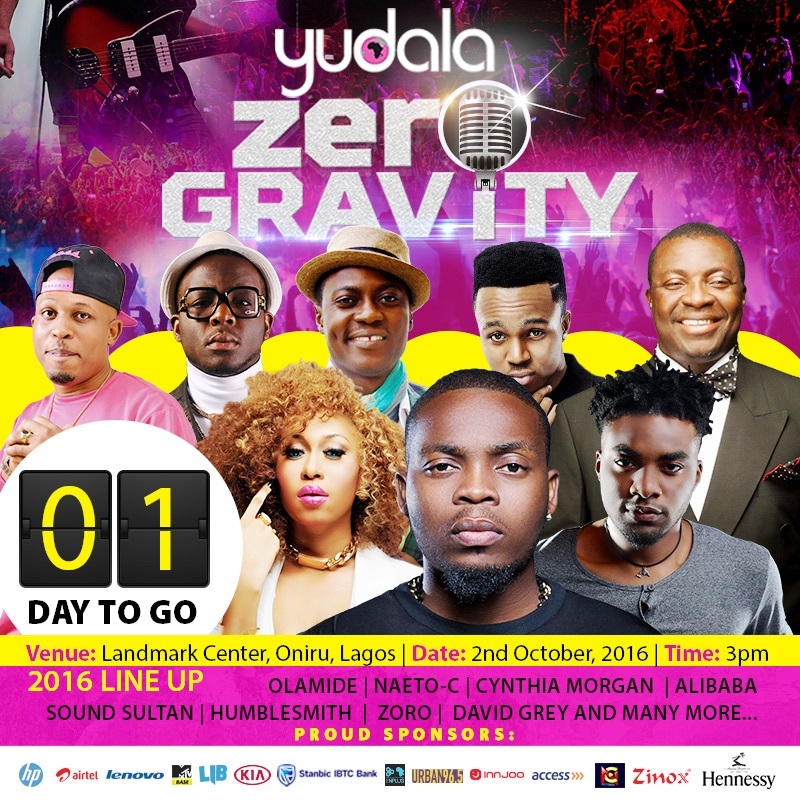 Yudala Zero Gravity is a multi-city digital entertainment concert powered by Yudala in partnership with New Concept Media Group (NCMG). The action kicks off with a Contemporary Music Blast at the Landmark Event Centre from 3pm on Sunday featuring a host of superstar artistes and loads of side attractions. A global telecommunications company that operates in 17 countries across Africa, Airtel operates a GSM network in all countries, providing 2G or 3G depending upon the country of operation. Airtel Nigeria have enjoyed pride of place as the telecoms outfit of first choice for millions of Nigerians who desire a smartphone network with the right assortment of products and services to help them realize their ambitions. Airtel has enjoyed a mutually beneficial relationship and long-standing partnership with trend-setting composite e-commerce outfit on YUBOSS - an entrepreneurial and wealth creation scheme targeted at wealth creation for unemployed and under-employed Nigerian youth. Both organizations have also collaborated on Gyming with the Stars, a popular and well-attended Corporate Social Responsibility (CSR) which offers Nigerians from all walks of life a chance to work out with their favourite celebrities. Already, a number of superstar artistes have been confirmed for the Contemporary Music Blast concerts in Lagos, Abuja and Enugu. The list includes Olamide, Iyanya, Phyno, Zoro, Sound Sultan, Flavour, Humble Smith, Naeto C, Cynthia Morgan, David Grey, Ali Baba, Akpororo and many more. Also, a number of premium corporate organizations such as Access Bank, Airtel, Stanbic Bank, HP, Lenovo, InnJoo Mobile, Uber and a host of media organizations including MTV Base, Trace TV, Urban FM, Classic FM, among others are on board as partners. 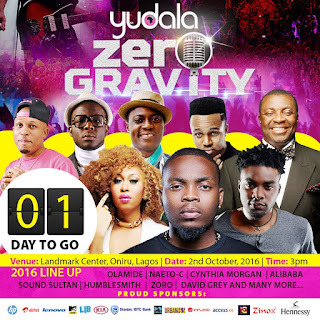 Yudala Zero Gravity will witness pure acoustics and live performances from the best Nigerian artistes in both genres of music, many of whom will use the platform to launch new tracks. It is a platform to see and hear it first.